The bikes that made the trip. 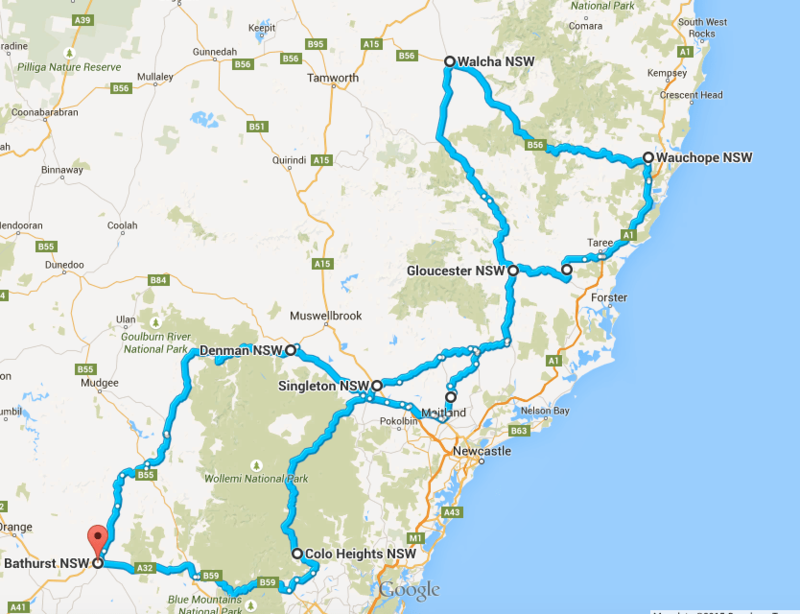 The Gloucester Autumn Ride was a 1327km 3-day (2-night) motorbike ride to and around the Gloucester region. The twisties to and around Gloucester made for some fun riding, with excellent mild and calm weather. The original trip was planned for Oct 14-16th, 2014, but because of a bike accident, the trip was postponed to May 23-25th, 2015. Photos of the trip are available here. On day 1, we enjoyed the Bylong Valley Way and Bucketts Way. On Sunday, after more of Bucketts Way, we enjoyed the highlight of the trip, the Oxley Highway, returning by the scenic, but rough and ready Thunderbolts Way. The return home included the Putty Road (best done as we did, on a week day) and the Bells Line of Road (which is still in the Australia Motorcycle Atlas, and was a great road, but has been ruined by super conservative speed zones, and zealous policing). An itinerary of the trip, containing the route, planned times, addresses, and contact details of the riders, is available here. A map of the trip is available here. Directions that may be useful next time is available here. Greg Vinall on a Yamaha TDM 900. Two adventurers had to withdraw at the last minute — Ed Tadzik who is in the ludicrous situation of having a lovely Norwegian wife who is not allowed to stay with him and his family in Oz, because of visa issues previously approved (good luck Ed in resolving this unbelievable situation quickly and painlessly), and Chris Bennett who had work commitments prevent participation in this glorious ride and a trip to Suid Afrika. Ah, the benefits of retirement, eh, Peter? Accommodation was at the Roundabout Inn, which is cheap, with ensuites, and about 2.5 star standard. Cost was $50 a person including a cooked breakfast in front of an open fire (or $35 for those who opted out of breakfast). For those of us not familiar with the WVW ways, we were treated to a WVW sight-seeing tour — a finger point here, a stand up on the pegs to get a better view there, and maybe an explanation after the ride. The WVW philosophy seems to be: Nothing is to get in the way of the ride! Peter W, for another sight-seeing tour — around Singleton. Those road works make finding the rare-as-hens-teeth petrol stations hard to find. Neil, for convincing me that the detour through Laurieton and Port Macquarie should not be included — there would not be enough time, and sight-seeing is not a WVW activity. We had more drinking time at the end of the day — no Zambooka’s sold at the pub unfortunately. Peter G for making the fantastic effort of riding up after his niece’s wedding (was he sober? ), solo, just to ride back with us the next day. Barry, for reminding me that only wimps would call this a Winter Ride. It’s only Autumn and still warm. Greg P for helping make it a great ride, and providing good company on Saturday night. Peter W, for enjoying watching me bounce my way to the edge of a 35kph corner. Everyone, for heeding Neil’s advice and keeping their distance from an accident-prone Greg V.
Neil, for giving others an opportunity to be lead rider — for, ooh, about 10km. Maybe we needed Peter Dykes to give him a run for his money. The talented muso entertaining the crowd on Saturday night. A great repertoire – from Led Zeppelin to Bob Dylan to Paul Kelly to Cold Chisel to kid’s songs. Everyone, for contributing to an enjoyable ride. Everyone, for tolerating me in a role I felt uncomfortable fulfilling. – information on the Steve Anderson Benefit Ride. WVW = Wanden Valley Wankers, an elite club of riders from the Hawkesbury/Blue Mountains area. Hey Greg! You left 90 cc’s off my bike. Well, truth be known, it’s really 101cc’s short. SHSHSH. We’ll keep it a secret. All fixed! We’ll never keep up now!